World Fair Trade day, Saturday 14th May was the day the Fair Trade institution chose to hang their fair trade cotton flags in Battersea Park. This world record breaking challenge meant that 3.4 kilometers of streamer was hung throughout the park to raise consciousness of the unfair trading condition for cotton farmers in West Africa. 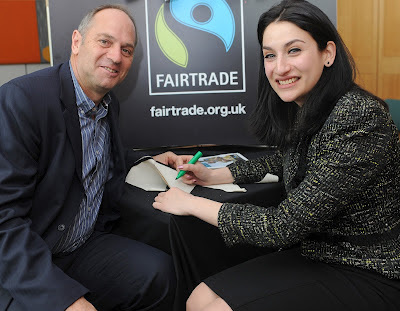 The campaign which was kick off during fair trade fortnight attracted over 130,000 being pieces of fair trade cotton bunting from towns, universities and other groups all through the UK. This was hung as a message to the UK Government and European Parliaments to stop excessive cotton subsidy. This year we supported fair trade fortnight by hold a fair trade tea celebration where the team ate fair trade food and drank fair trade tea, coffee and hot chocolate. The Myakka store Outlet team also wore fair trade cotton t-shirts throughout the fortnight. To find out more information on the Fair Trade Foundations campaigns as well as more information on the world record breaking challenge. They are waiting to hear from Guinness World Records for their approval of the record breaking attempt. Labels: UK, UK Government and European Parliaments, West Africa.